Friday Friend–Bonnie Doran & A Giveaway! It’s been a while since I’ve had a friend stop by on a Friday. Today’s guest writer is Bonnie Doran. She tells me her heart is in science fiction. She enjoys reading, cooking, knitting, solving Sudoku puzzles, and telling groan-producing puns. Her published works include six magazine articles, three short stories, 67 devotional writings, and her science thriller, Dark Biology. 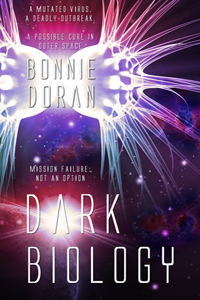 And Bonnie wants to give one lucky winner a print copy of her book, DARK BIOLOGY. To be entered to win, leave a comment. A name will be drawn next Friday! Not many women claim they’re married to a Mad Scientist. They might be a military wife or pastor’s wife. Not me. Thirty-one years ago, I had celebrated by 31st birthday and broken up with a boyfriend. I figured I’d never find that special someone. I was living on the Central Coast of California at the time. Then Don, friend of mine, played matchmaker. He knew a guy who worked at Vandenberg Air Force Base as an electrical engineer with Martin Marietta, now Lockheed Martin. Does anybody remember the MX missile? Yes, he was a rocket scientist at the time. Don was his quality control inspector. We exchanged photos before we met. John’s photos showed him playing a harp and working with his homemade laser. He also had a photo of his Siamese cat. We rendezvoused at Don and Tricia’s place and went out for dinner. The rest is history. John proposed after two and a half weeks and we married three months later. Six weeks after that, John completed his work and we moved back to Denver. We’ll celebrate our 32nd anniversary this May. I should have suspected that John was a Mad Scientist. He owned a home-built laser that had been his senior project at Georgia Tech. He spent his free time with computer and model-rocket groups. Although the label of Mad Scientist hadn’t occurred to me, the moniker fits him well. He built a Tesla coil. One of his latest projects is working with a Van de Graaf machine. He has a 2,300-pound electromagnet that now resides on the production floor of his company which builds laser-engraving machines. Getting that electromagnet out of the basement of our house required several men and a mechanical engineer who devised a block and tackle. For a number of years, he’s been a member in good standing of the Denver Mad Scientists, an informal club which meets at a restaurant for brunch and at a pot luck at someone’s home every month. The conversation usually disintegrates into techno-speak about computers, electronic design, or the latest sci-fi movie. So yes, I’m a Mad Scientist’s Wife. My experience as such resulted in a flash fiction piece, “The Mad Scientist Pot Luck” which Splickety Magazine published several years ago. John sees a few of his quirks reflected in one of my characters in Dark Biology, but of course I disavow the novel bears any resemblance to real people or events. Thanks, Bonnie. Here’s a little more about her book, DARK BIOLOGY. And by the way, Bonnie, I love this cover! It’s awesome. Renowned vaccinologist “Hildi” Hildebrandt has set her sights on beating her brother to a Nobel Prize, and the opportunity to conduct experiments on the International Space Station might just provide the means to obtain that goal. Chet Hildebrandt should have had that opportunity. But now he’ll teach a lesson to them all: his hot-shot astronaut sister, his philandering hypocritical father, and the CDC for not properly appreciating his work. One vial of a virus purloined from the CDC labs and released at his father’s marriage seminar should do the trick, without hurting anybody. After all, it’s only a mild influenza strain…Or is it? Don’t forget to leave a comment to be entered to win the book! ← Are You Ready To Play In The Super Bowl? Thanks for hosting me, Lillian. Good to meet you, DK. I had a lot a fun with the post. You’re welcome, Bonnie. I always love to promote PBG authors like myself. Well, maybe you’ll be the winner, D.K.